The Chug is an attentive and active companion, and though it has a short history it is one of the most sought after hybrids around. 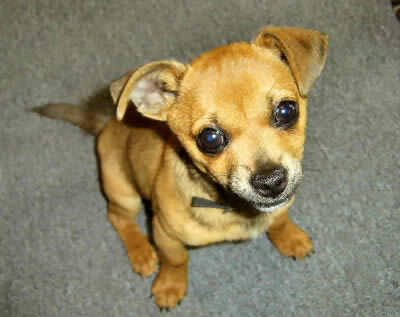 The Chug is a mixed dog breed, a cross between a Chihuahua and a Pug. Chugs are lively and loyal companions. They are very affectionate and expect lots of attention. They may or may not tolerate strangers or other pets and animals, and though they usually do well with children they may or may not be the best pet for young ones. They do, however, tend to make good watchdogs. When selecting a Chug, look for eye and respiratory problems. Breed Type The Chug is a mixed breed. A cross between a Chihuahua and a Pug, the Chug is a popular hybrid. Background The Chug has a short history, but it has already become one of the most sought-after hybrids around. Most breeders produce only first generation crosses to preserve the health of the Chug. Description Chugs come in many different colors. Their muzzles are longer than the Pug's but more blunt than the Chihuahua's. They may have short or medium length hair. Their ears are often short and floppy. Sizes vary, but Chugs are always relatively small. Care and Feeding The Chug needs a nutritious diet and it must be fed lightly to prevent obesity. Chugs are easy to groom. Occasional brushing and as-needed baths should be sufficient. Be sure to dry your Chug quickly after bathing, and take special care to get the ears dry. Some Chugs shed heavily. Regular vacuuming is essential during shedding periods. Housing Your Dog Chugs should live indoors, and they do well in apartments. They have a hard time adjusting to extreme temperatures, especially cold ones. Social Behaviors Chugs usually do well with children, but they may not be the best type of dog for young ones. They may or may not be tolerant of strangers and other dogs and pets. Handling and Training Chugs are very smart, but they may be stubborn when it comes to training. It is important to be firm yet gentle for best results. Activities Chugs need daily walks and play sessions to keep them happy and healthy. But it is important not to overwork them due to their tendency toward respiratory problems. Breeding/Reproduction The fact that they come from parents of two different breeds makes most first generation Chugs very healthy. But if you breed a Chug with another Chug, it is important to check bloodlines of both your dog and any potential mate for hereditary illnesses. Eye and joint problems, and Pug Dog Encephalitis, are some of the more prevalent disorders to look for. Common Health Problems First generation Chugs rarely have serious health problems. Of those that do, they usually consist of eye problems and respiratory difficulties. Your veterinarian can determine the best treatment for these ailments. Availability Chugs may be difficult to find in some areas, but their growing popularity is making them easier to locate. Prices vary. Also I elevate his food bowl on a stack of magazines with a dishcloth on top against a wall so he doesnt have to dip and bend his throat to get the food down. He chokes and gags on his food if he has to bend his neck down to eat it. He keeps his neck straight and eats smoothly. I also boil a sauce pan of water every night and turn the heat off after it boils, and drop a teaspoon of Eucalyptus oil (vitacost.com) in the water, take it with a pot holder and holding a dishcloth underneath, I wave it around where he is sitting or set it nearby him on a safe table or shelf of course, and the vapors help him breathe alot. Sometimes I carefully hold him above the pot of steam and make him breathe it in. You could do the exact same thing with a Vick's vaporizer/humidifier too, I just prefer to have the portable sauce pan technique. I try to keep the house really clean of dust and use the eucaylptus pots to clean the air and set it in every room once a day. All of this stuff is really easy and only takes a few minutes a day. Hi, Autumn! Thanks for the info about your sweet little Chug! I just got one a few days ago and she's just precious! She's so sweet and so smart! When she needs to go outside to pee or poop, she will whine until I take her out and she's ONLY 8 weeks old! I could hardly believe it! I hope I'm lucky enough to have her as long as you've had your sweet baby! Thank you again for the info and recommendations! I'm getting my first one friday ! Rescue dog. 13lbs they say. He's getting spaded at the vets so i have to wait! This dogs are fine with daily walks around the block. My chug is hot natured, he used potty pads if wet outside he does not like wet grass. Really likes his leash, uses it as a tug-of-war toy and walks himself with it. Carried him in a purse for the first year. Have a hard time leaving him when I grocery shop, a little dog friend helped. Are there any Chug puppies or young adults available in the Denver area? Looking for lovable companion. My fiance rescued a pug from a No Kill shelter several years ago. He was so severaly abused he was missing almost all of his fur and he had fleas so bad he lost 1 of his eyes so my fiance named him Uno. He didn't know how to walk on grass or even play. He never barked, gave kisses, or jumped up to greet us. Sadly Uno passed away last year and my fiance was devistated to say the least, So when we came across the chug I knew I had to get him a Chug puppy! If any one could let me know of any puppies in the Pennsylvania are I would greatly appreciat it. Thank You. I have pugwawas for sale. I am from Twin Falls id if anyone would like to know more just comment back!